Preliminary Patient Insurance Information - For insurance patients, please complete this questionnaire and bring with you to your initial consultation at our office. Health Questionnaire - Complete this questionnaire and bring with you to your initial consultation at our office (10 pages). 6-month DS Lab orders - Take this form to the lab when you have your 6-month post-op bloodwork done. Annual DS Lab orders - Take this form to the lab when you have your annual bloodwork done. Annual VG Lab orders - Take this form to the lab when you have your annual bloodwork done. 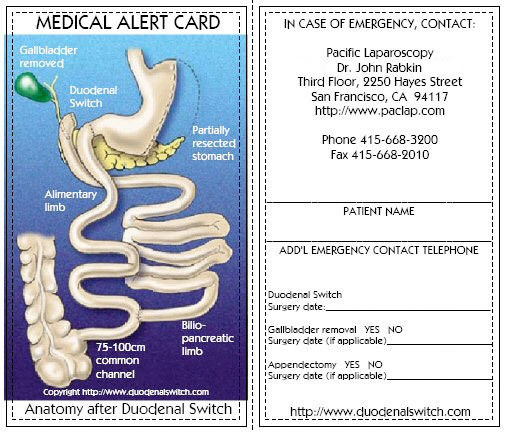 Wallet Card - Print and laminate this card to carry in case of emergency. Progress Notes - Fill out this form and bring with you to your initial and follow-up visits to our office.